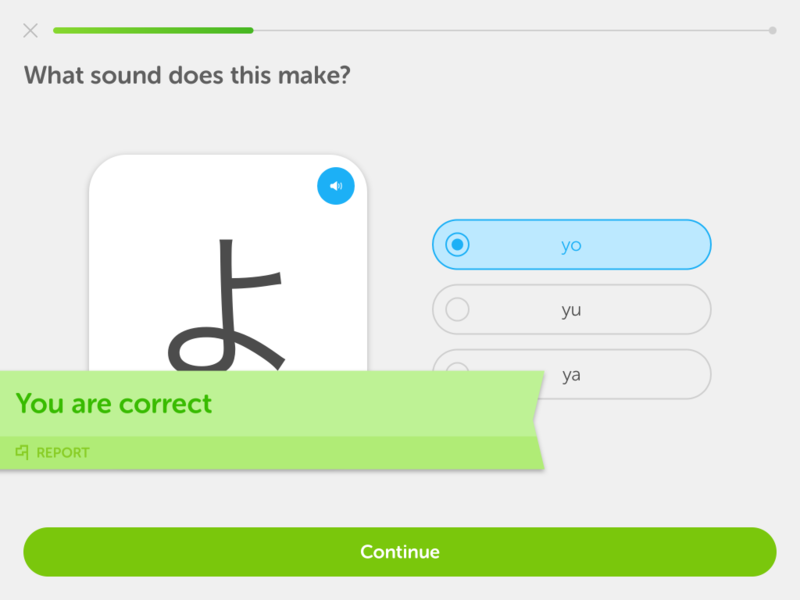 At long last, Duolingo has released its Japanese for English speakers course. But does it live up to the hype? 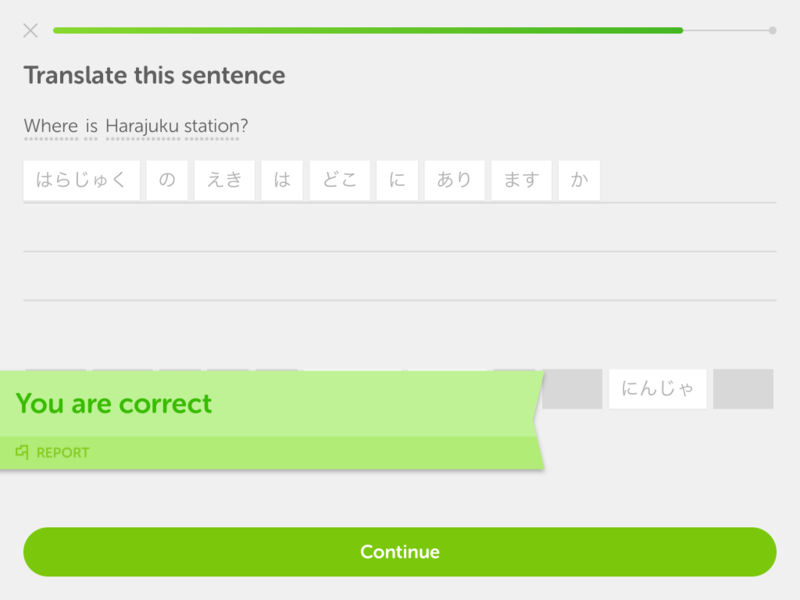 It’s been a long time coming, but the Japanese for English speakers course is finally available on Duolingo. With millions of users and an offering of nearly 20 languages (with another half-dozen in development), Duolingo is one of the most popular language learning apps on the market today. And best of all, it’s free. But is it actually going to help you learn Japanese? There’s a lot to unpack here, so let’s look at what’s covered in the course. Upon opening Duolingo and selecting Japanese, I’m greeted with this screen. 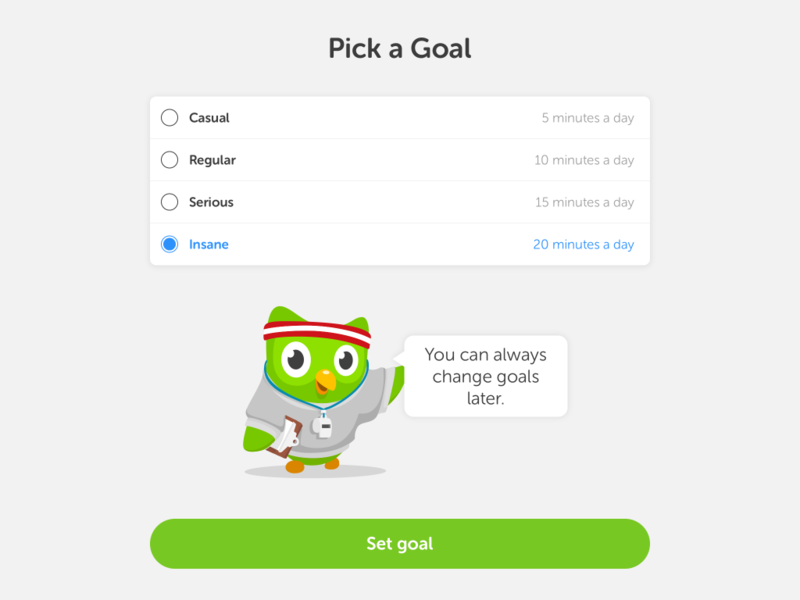 Apparently, Duolingo considers 20 minutes of studying per day “insane.” I see where this is going. We begin by learning numbers through hiragana. The audio is recorded by a native speaker and sounds fine. Pretty standard fare, albeit on the less-challenging side. There’s hand-holding, then there’s this. We continue along, learning more numbers and more hiragana. 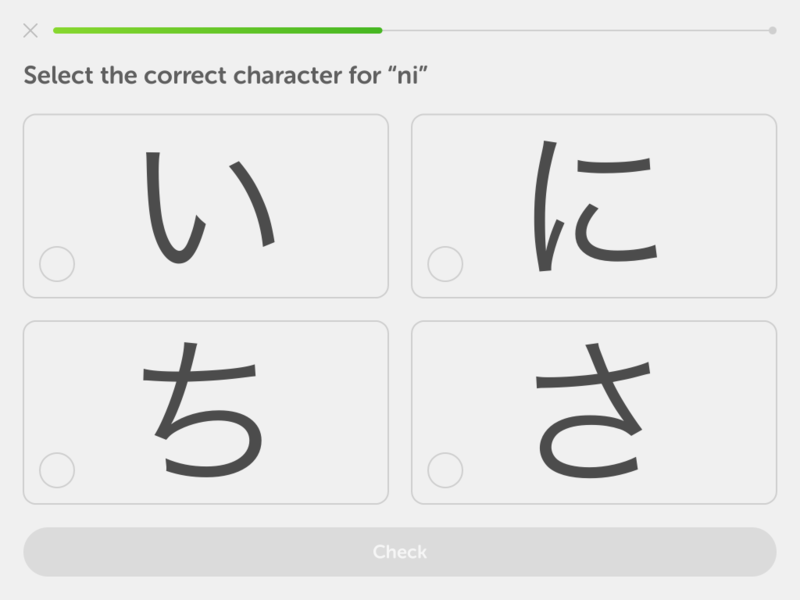 I actually kind of like this method of learning hiragana, to be honest. 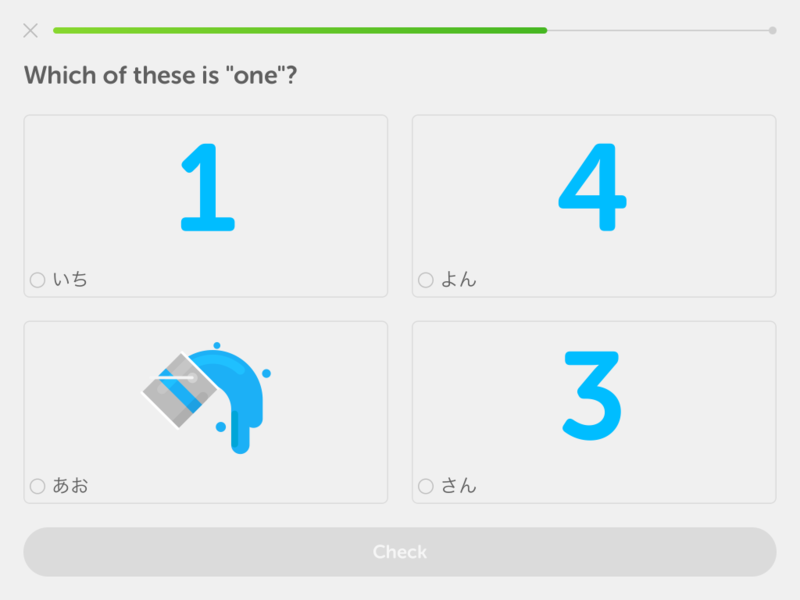 We start getting into multiple choice questions, which Duolingo unfortunately relies a lot on. Instead of a static image, insert a repeating animation of the character’s stroke order that you can tap to replay to your heart’s content. This way learners can practice writing out the character on their own. Ditch the multiple choice for a short answer blank that forces you to type out the individual keys “y” and “o” for better reinforcement. Multiple choice really doesn’t do learners any favors in terms of retention. All right, now we can greet someone in Japanese. Neat! 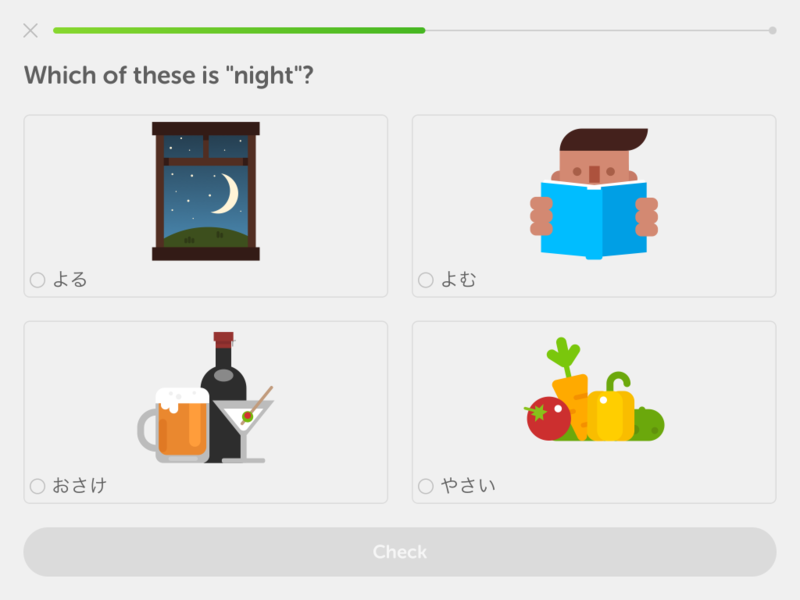 Duolingo begins introducing some basic vocabulary words: vegetables, alcohol, our first verb (“to read”), and certain times of day. We also see the introduction of katakana, which gets mixed in with the hiragana we’ve been learning. A little confusing, considering there’s zero explanation for this second character set. The vast majority of learners probably won’t even realize that katakana is a totally different writing script, which is a little worrying. 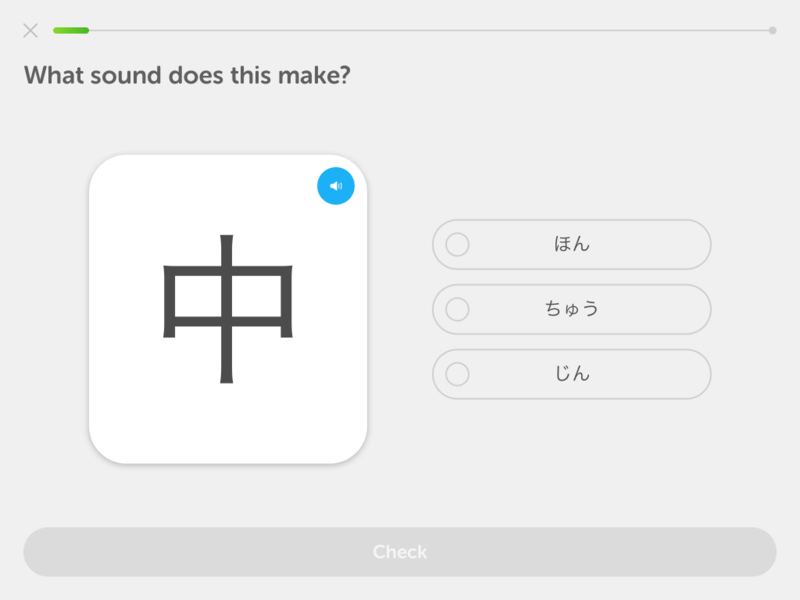 Duolingo goes a step further and tosses in a kanji for good measure, just in case you weren’t already blissfully unaware that you’ve now encountered 4 different writing scripts. I wouldn’t necessary call this a good or a bad thing–it’s just another way of teaching–but I don’t always like having to deduce what I’m learning. We encounter the polite copula です for the first time, but unfortunately, we still don’t have a clue how to say or write our own names, which makes the language feel less personal. That is, of course, unless your name actually is John. We also start running into some hiccups in the system. The correct answer in the picture below is “ちゅう” (chuu), but when you click on the sound, the speaker responds with “なか” (naka). 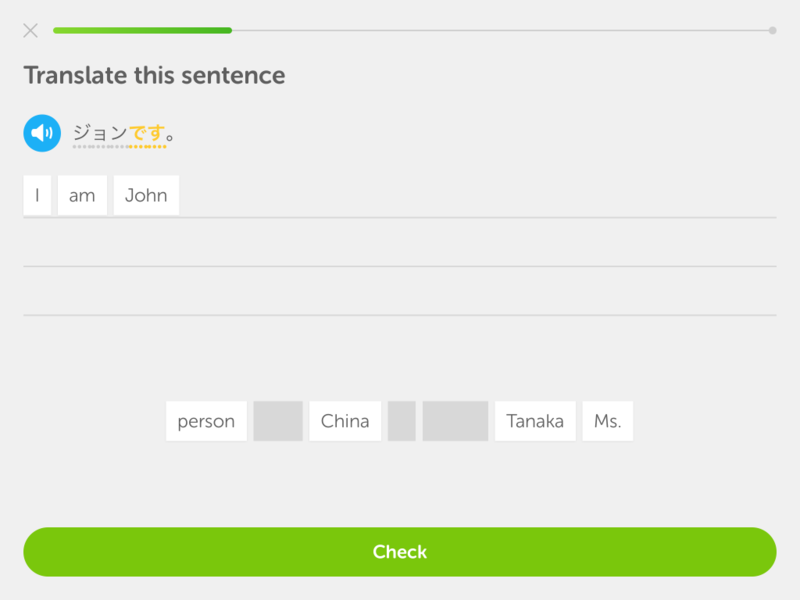 I know we’re still in beta, but it points to one of the current issues with Japanese and Duolingo: how it programmatically handles the variety of possible character readings. Let’s hope they work this out by the end of the beta phase. 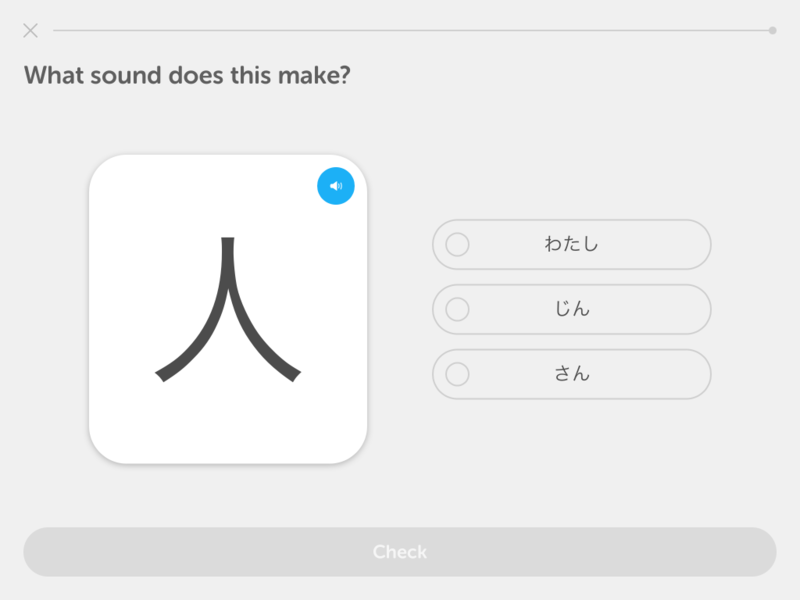 Duolingo also has no choice but to pronounce は as “ha,” even though it should be “wa” when used as a standalone particle. I make some nitpicks in this article, but this is a pretty serious issue and I’m genuinely surprised it made it through to the beta. We also start running into strange translations. Oh, you are, are you? Pretty soon, we run into our first particle question. Wait, when did we learn about particles? Speaking of particles, we run into a new one, が, which is introduced alongside and seems to function in a similar way to は, but for some reason, we’re using が here instead. Maybe we can just use both interchangeably? Maybe they’ll clarify later? We also haven’t received any explanation of how consonant gemination, indicated by the っ, functions. 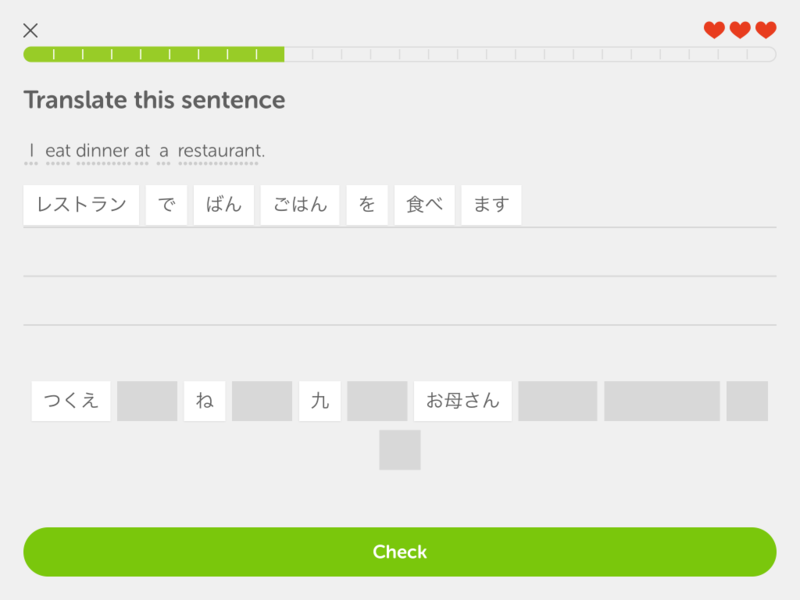 For better or worse, everything in Duolingo is learned by induction, similar to Rosetta Stone. Moving forward in the course, we start learning demonstrative pronouns (こ・そ・あ・ど, as in これ・それ・あれ・どれ・etc.) and common food names. We then learn to tell time, coming across some more katakana and household vocab along the way (e.g. テーブル, プール, and トイレ). Next, we start picking up more pieces of the self-introduction puzzle, like 大学生 and 年生. I think we’ll be able to start speaking Japanese soon! Unfortunately, no one who uses this app will ever need to say this in real life. Is it わい・ます? Is it わ・います? 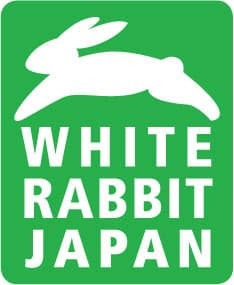 Where did the わ come from? How does it function? …wait, what? How is this going to help me order food? 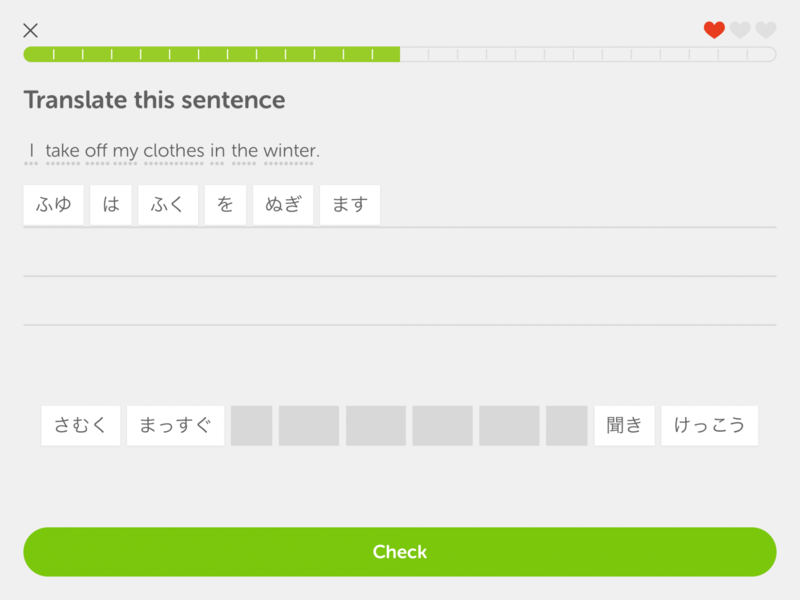 Actually, this might be the most useful sentence on Duolingo. Oh well, let’s press on. We start talking about activities like studying and going to parties, making plans, learning the days of the week, etc. Some directional words are also thrown in for good measure. Next up, we learn how to talk about basic hobbies (listening to music, reading, etc. ), as well as some modes of transportation. It’s useful content and pretty par for the course. Then come clothing and weather. We’re still apparently learning colors, but at least we’re expanding our vocabulary base with words like rainy, sunny, and snowy. Again, pretty useful stuff. We pick up some more food words like “spicy” and “tasty,” as well as more vocabulary for asking directions. We also finally learn かわいい. Took long enough! The third section (of four) is rounded off with the “people” category, which introduces a few more ways to describe those around you: boy, girl, he, her, grandma, and grandpa, among others. We’re making good progress, but I’m starting to notice that as sentences become more complicated, Duolingo becomes way less flexible and understanding; It does not know how to recognize context. Grammar-translation rears its ugly head. You’re lucky you’re still in beta phase, punk. Anyway, bugs and quirks reported, we put on our hiking packs and head out into nature with new words like mountain, tree, and river. Then we learn a little classroom Nihongo, which will probably only serve to remind you that you’re not in a real Japanese class. …sorry, I didn’t mean that. I can be bitter sometimes. Anyway, we learn how to express our feelings (fun, scary, tired, and even the explanatory ～んです) and pick up a few other useful shopping-related words (necktie, blouse, business shirt, and…butter!). We’re also apparently still learning katakana. A couple of sections later, we arrive at the grand-daddy of all categories: Vacation! How is any of this going to help me make my way around Japan!? 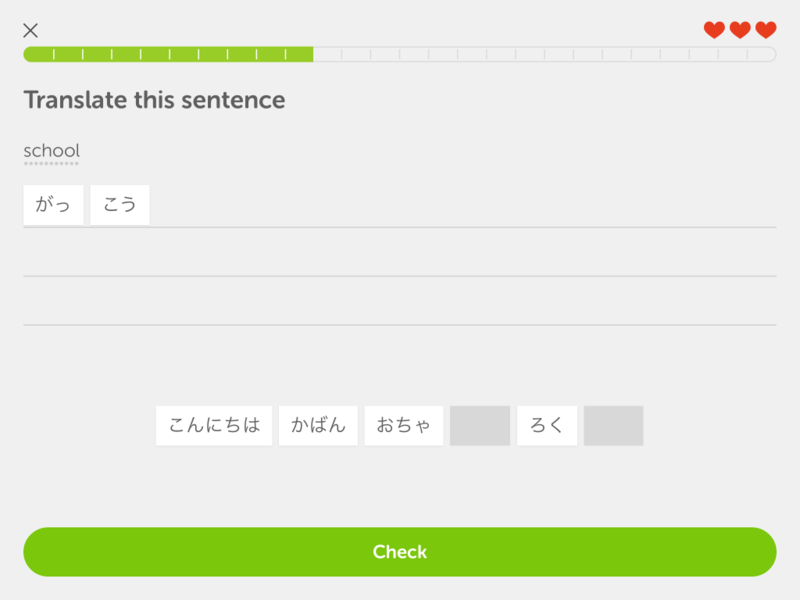 Actually, a lot of Duolingo users might be able to relate to this one. The final stop in our journey lands us amidst the hype Japan is trying to drum up before the Tokyo 2020 Olympics. Indeed, the land of the rising sun will see plenty of visitors in the coming years, with ever record-breaking numbers coming over to visit ancient temples, go city-hopping by bullet train, and eat the some of the best food the world has to offer. And the trend will only continue to build until the Olympics. Frankly, I hope it never stops, because Japan has so much to offer the world as well as benefit from as it continues to open itself up to more and more travelers. 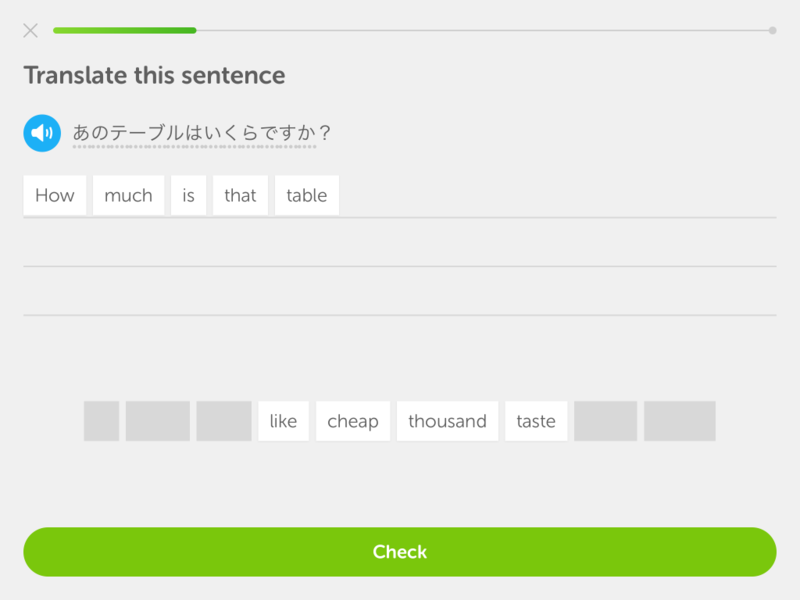 Alright, we’ve come a long way, so let’s a moment to look at everything Duolingo’s Japanese course has to offer. That’s 97 kanji in total. Honestly, you know what? That’s not too bad. In terms of JLPT levels, that puts you right around an N5, and the grammar forms and vocab (which I’m admittedly too lazy to count), just from eyeballing things, are similar to what’s covered in Genki I. 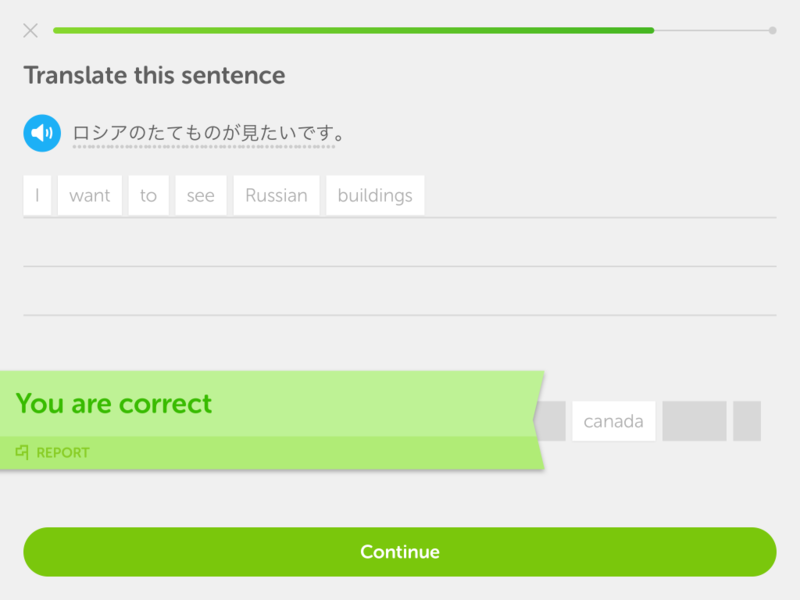 In other words, Duolingo may just be what the doctor ordered for people who absolutely loathe using textbooks and would rather just sit down and start learning Japanese for free. All that glitters is gold, baby. And with that said, I think we can finally start getting opinionated. My favorite part! It’s fun. 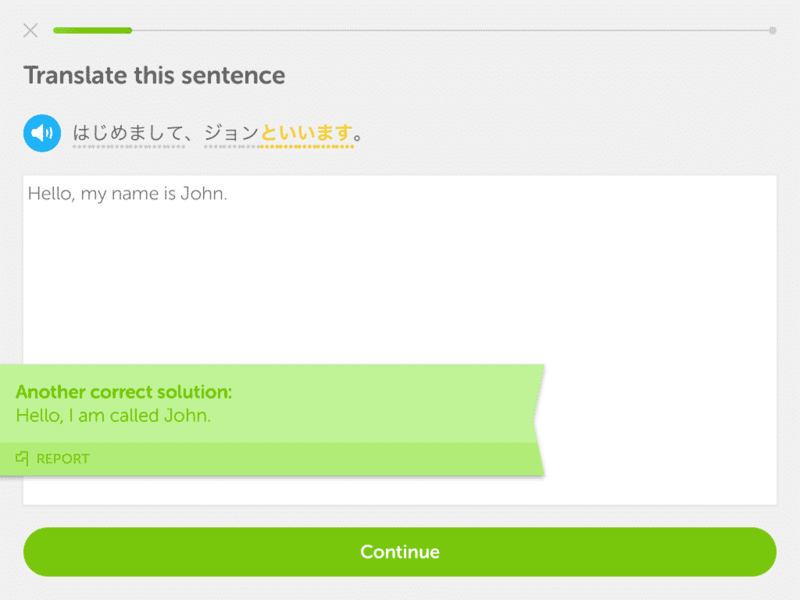 Duolingo makes learning fun thanks to the effective and subtle use of gamification. Motivation plays an important role in learning any language, especially for self-learners, and Duolingo does a great job of keeping you coming back for more. It’s smart. It knows where your weakest points are and gives you more practice in those areas. It’s repetitive. You’ll revisit topics and retrain skills to keep them sharp thanks to its use of spaced repetition (SRS). It DOESN’T overly rely on rōmaji, which is great. Rōmaji isn’t really used in everyday Japan, and when it is, there’s almost always English right next to it, so you never really need it. Best to kick off those training wheels early! Computer-generated audio clips and sentences, while not terrible, means you’re not listening to authentic spoken Japanese, and you end up getting a lot of nonsensical sentences that you would never hear in real life. In my opinion, this can be a waste of precious time that should be spent listening to, you know, actual Japanese speakers. Wouldn’t it at least make more sense to take your clothes off in the summer? 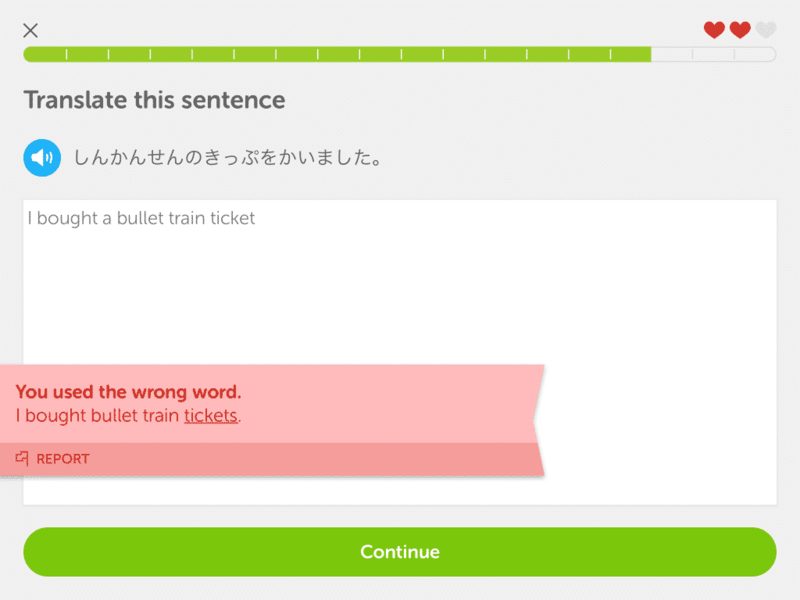 Duolingo is teeming with language errors. Every resource is prone to having mistakes, but content in Duolingo isn’t vetted as thoroughly as, say, a published and peer-reviewed textbook. Learning incorrect Japanese: also probably not a great use of your time. It doesn’t teach you what you actually need to know to communicate. 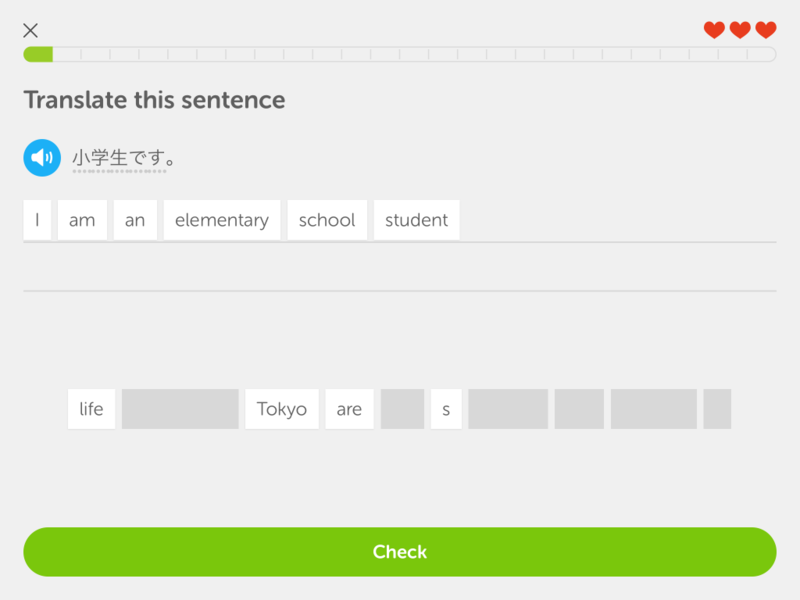 Given that things like travel are huge motivating factors for many learners, it surprises me how little Duolingo actually prepares you to use Japanese in real life situations. Bring your phrase book on your upcoming vacation; you’re gonna need it. 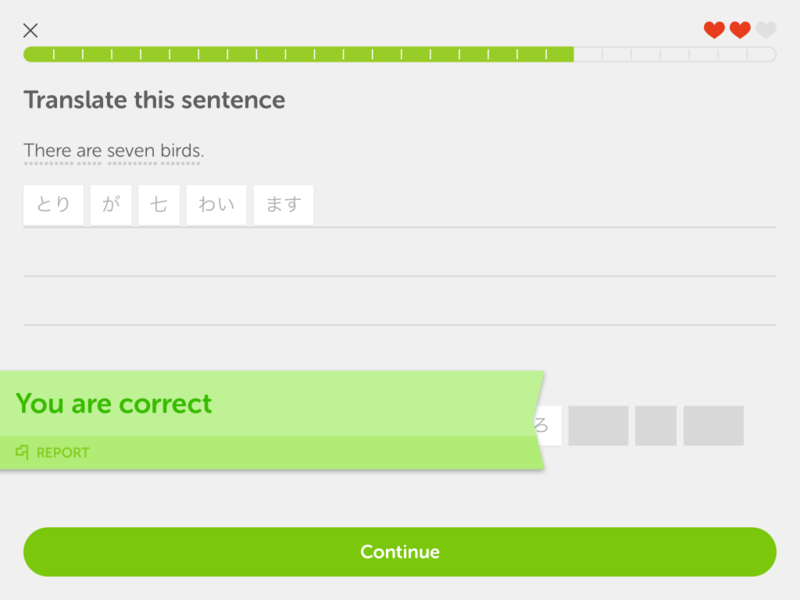 Duolingo relies heavily on translation and a practice-drill-practice-drill format for learning. There’s no spontaneous creative output and there’s hardly any emphasis placed on communicative aspects of the language. It doesn’t teach grammar. Duolingo assumes you’ll pick up on grammar rules via its inductive approach to teaching. If you liken it to learning how to drive a car: Yeah, technically, you can just get in, turn the key, play with some buttons and knobs, and you’ll probably figure out how to make it go. But if you’ve never driven a car before, it’s probably best to learn about the rules everyone follows and a little bit about what’s going on underneath the hood. This way, you’ll become less likely to get in an accident or break down in the middle of nowhere. Duolingo does almost nothing to prepare you for the language learning equivalents of these situations–which will happen to you at some point–and Duolingo may even be working against you by being overly reliant on multiple choice. The inductive approach to learning can be a powerful tool, but it tends to suit more advanced learners who already have a decent grasp of the language. As mentioned above, it’s currently only optimized for iOS, which leaves Android and web users in the dark for now. This is problematic for a myriad of reasons, including the fact that Duolingo is best experienced in a web-based (desktop) format. I imagine that other platforms will be supported after beta, but it’s still unfortunate that only iOS users have the chance to take Duolingo for a spin. 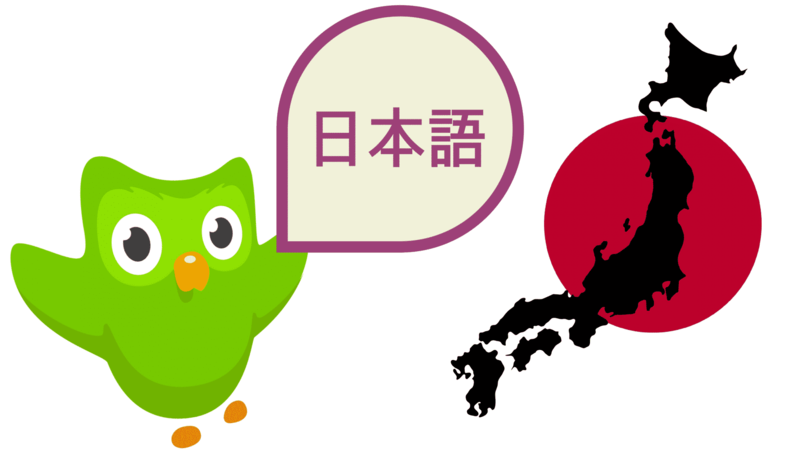 *Update #1: According to an AMA on Reddit with the Founder/CEO of Duolingo, Japanese for Duolingo will be coming to Android in 1-2 weeks! There’s no available estimate on the web version, but it is confirmed to be on the way. *Update #2: As of June 1, 2017, the Android version is confirmed to have begun rolling out! It’ll be a gradual process, but at least it’s finally here and should be making its way to your Android device without much further delay. Still no ETA on the web version, sadly. …but hey, it’d be a bit depressing to end the article on that note, don’t you think? After all, any schmuck can sit there and point out what’s good or bad about something. And while I may be your average Joe, I certainly ain’t no average schmuck. So let’s be constructive. Rather than talk about if you should use Duolingo (because the fact is, many people are going to anyway), let’s talk about how to use Duolingo to enhance your learning. We’ve established that Duolingo isn’t enough on its own. 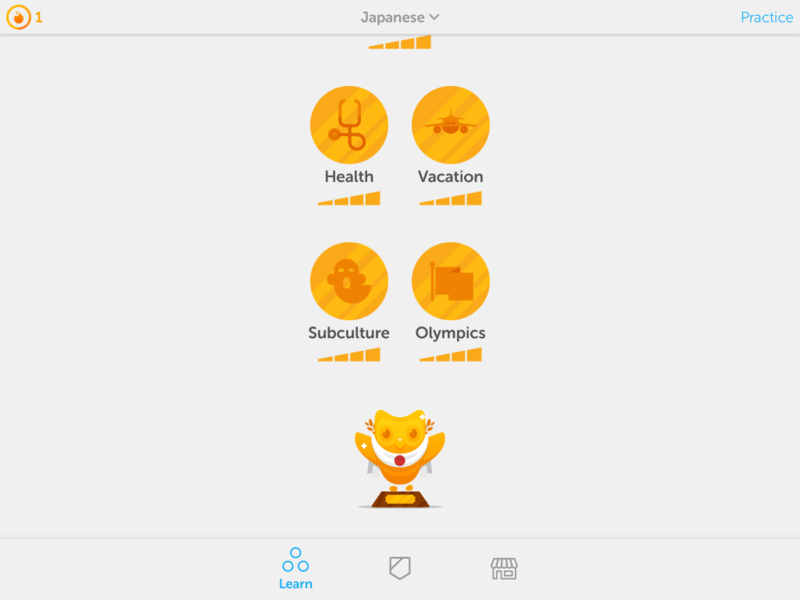 However, I think Duolingo has a lot of potential to make Japanese, which is a notoriously difficult language, more accessible and enjoyable for new learners. And honestly, let’s face it: Anything that makes you want to study is a powerful motivational tool that should not be underestimated. The key to using Duolingo effectively is to take advantage of its strengths and make up for its shortcomings. Here are a few tips to make the most of your study time. Duolingo also keeps track of how many days in a row you’ve reached your daily goal, represented by the fiery “streak” mark that appears at the top of most screens. Set a reasonable goal and get cracking. Find some time to study every day–no exceptions. Even 5 minutes is usually enough time to knock out a quick session. Take his advice and don’t skip leg day–er, your reviews. While the mobile app is impressive in its own right, it’s lacking one major component found in the browser version: the ability to hand-type answers. Instead, the mobile app features questions in which you drag and drop answers from a finite set of options, few of which actually make sense in the context of the question (thus often making it mind-numblingly easy to guess). With the browser version of Duolingo, however, you’re giving yourself more of a challenge–this is a good thing–because by typing in the answers to every question, you’ll have better retention of vocabulary over the long term. 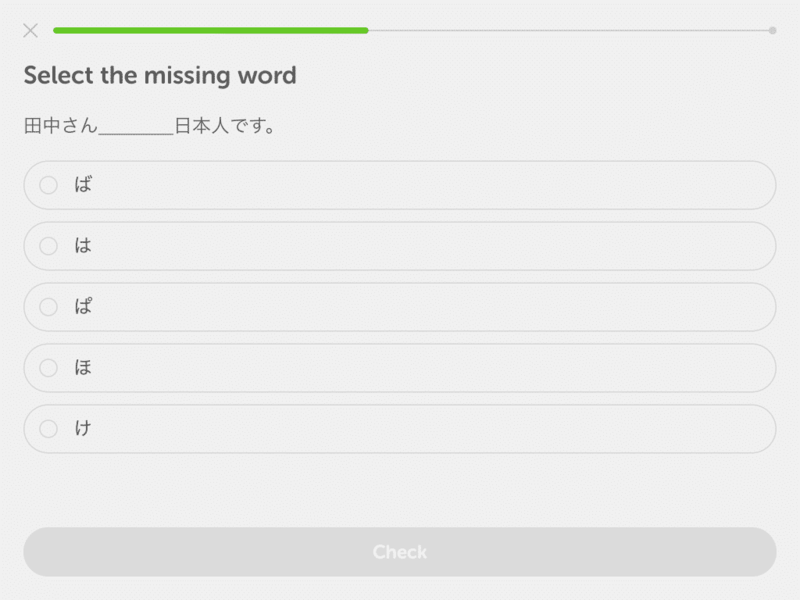 In addition, the web versions of most languages on Duolingo include at least some degree of grammar explanations, and I’m sure Japanese will be no exception. 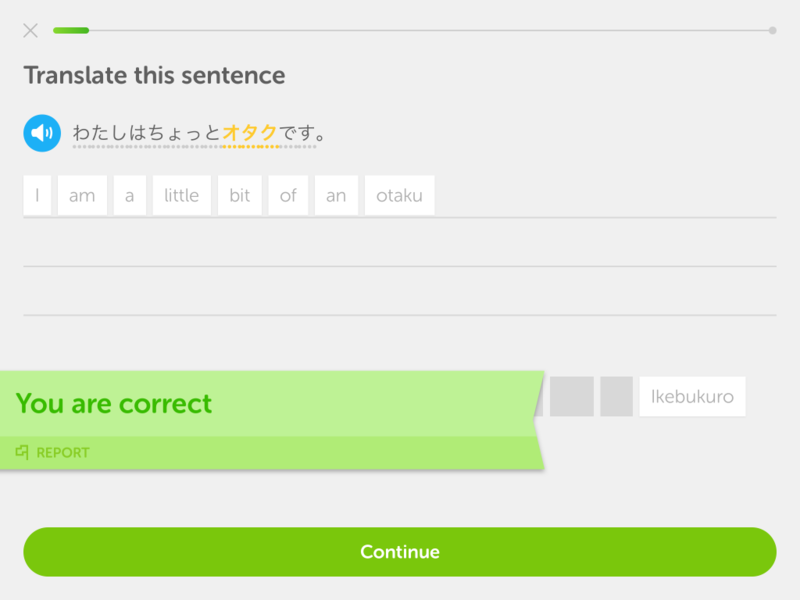 *Edit: After finding out that Japanese for Duolingo is only optimized for iOS and Android for the time being, I had to add an asterisk to this tip. Thankfully, until the web version arrives, there are plenty of ways to supplement your Duolingo study. Read on! Now that you know how to get the most out of Duolingo, what should you be doing outside of the app to get the most out of your study time? Having a solid goal in mind and a roadmap to help you get there will do wonders for you as a learner. The 6-step study plan here on Kuma Sensei is a good place to start. It’s chock-full of study tips and important factors worth considering for anyone wishing to learn Japanese. I recommend a hearty helping of flash cards every day, even on top of the daily reviews that Duolingo asks you to complete. Anki is a great option that’s free (except on iOS) and comes with plenty of room for customization and pre-made, shared decks that you can download. Try out the Core 2k (and eventually Core 6k) deck–though I prefer the much more user-friendly equivalent found on iKnow!. 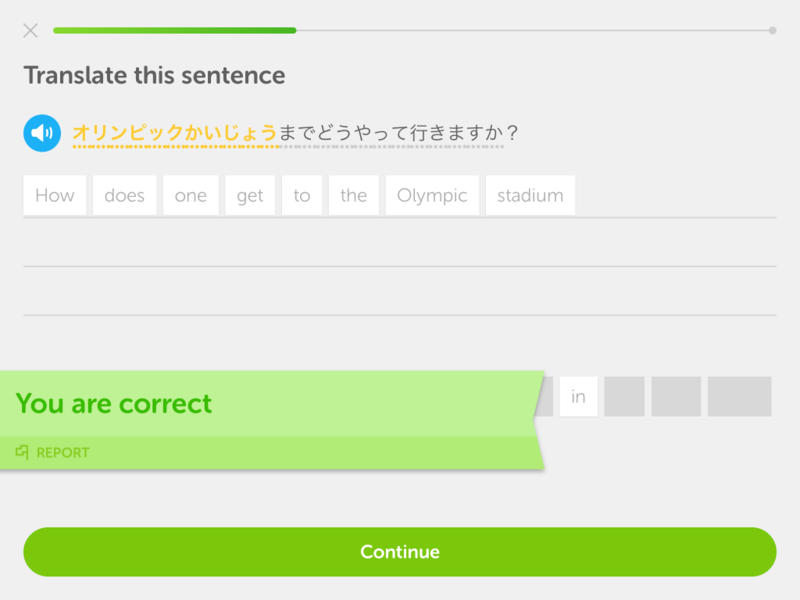 The Duolingo stream on Tinycards might also be a decent place to keep an eye on as the course becomes more popular. 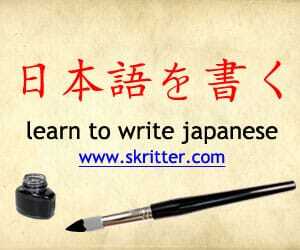 If you’re interested in improving your kanji reading and writing abilities, Skritter is a good option. There’s a plethora of study lists spanning from absolute beginner to advanced Japanese, and a number of these lists are taken directly from widely-used and popular textbooks in the field, which is a boon for self-learners who may find textbooks daunting without the guidance of a teacher. Skritter uses the power of SRS to feed you content only as much as you need to see it, and its beautiful and intuitive writing interface makes for a great user experience. It’s available on both iOS and Android, so give the free trial a shot and see what you think. For additional grammar explanations to supplement what you’re learning in Duolingo, there’s a number of resources you can turn to. First and foremost, I have to recommend getting a textbook if you want to take your learning seriously. Genki is a good place to start. Make sure to also pick up the accompanying workbook for extra practice! Having reliable points of reference can also make a world of difference. Tae Kim’s Grammar Guide is a free resource that can come in handy for explaining certain grammar concepts. Perhaps the most useful grammar resource I’ve ever used is the Dictionary of Basic Japanese Grammar by Seiichi Makino and Michio Tsutsui. I’ve dubbed this 600+ page monster the “Yellow Bible” for a reason. You can read more about it on my Learning Resources page in the beginner section. At the end of the day, grammar is best learned through exposure to lots and lots of input, so while these resources are useful for getting into the nitty-gritty of things, you should also be inadvertently coming across new grammar forms in your flash card program of choice and pushing yourself to learn at the i+1 level. Nothing beats a living, breathing teacher when it comes to learning a language, and conversing in a new language is indeed something that takes practice–and lots of it. italki gives you access to private tutors for as little as $10/hour. 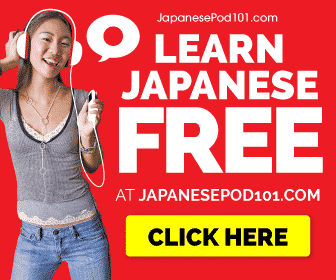 You could do a monthly or even weekly lesson to touch base with a native Japanese speaker as a way to stay motivated and monitor your progress. italki boasts a wide selection of teachers and price ranges, so you’ll likely find something that’s a good fit for you. Using that link, you’ll even earn a free $10 in lesson credit to get started! Joining a community like the one found on Reddit can be a good way to get involved in the learning process with others and help bring Japanese to life. You can often find interesting discussions about learning methods and resources, as well as ask questions of your own! You can also join a study club right in the Duolingo app. It’s a nice little way to team up with others learning the language. In fact, you can even join club Kuma Sensei! There are only 14 slots, so it’ll fill up fast, but feel free to make your own club and invite others! Leave a comment below with your club code if you want others to join. I know that some of the language in this article has kind of an edge to it, but consider it tough love. I’m saying these things because I appreciate the hard work the creators have put into the course and want them to keep striving for greatness. I also want to encourage learners to be critical of the resources they use to learn. 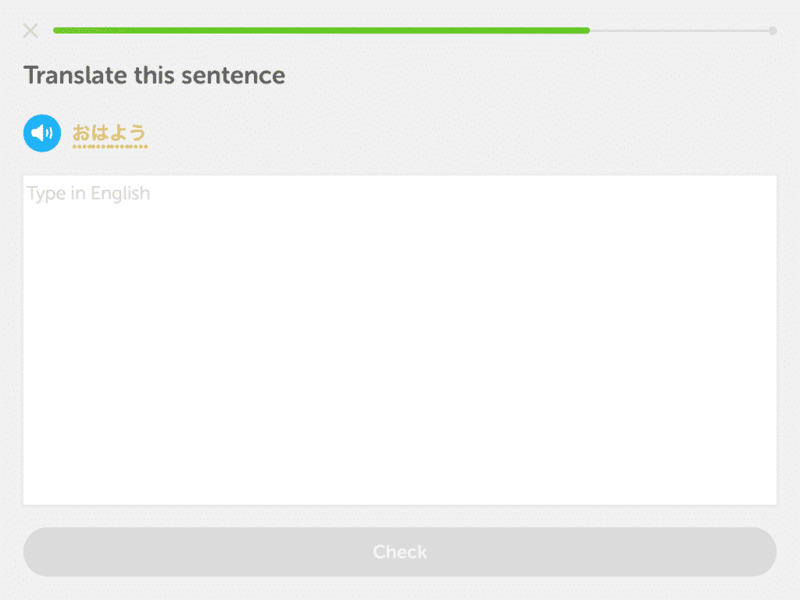 In any case, Duolingo is a well-made app with a smooth, clean user interface. It does a great job of keeping you motivated and hungry for more learning, which should make it a popular study resource among beginners. However, the reality is that Duolingo’s Japanese course leaves a lot to be desired for serious learners. …but the course’s biggest downfall is perhaps the format of Duolingo itself. As I mentioned before, Duolingo falls short in teaching you how to actually communicate in the language. I would be legitimately surprised if someone could even manage to order food at a restaurant by the end of the entire course. It also teaches grammar from a top-down method, lacking detailed explanations about how stuff works under the hood. This is a matter of teaching style, and I personally prefer to think of grammar structures as tools in my language toolbox; I want to know what each tool is capable of and how to use it. Disappointingly, we can probably expect none of these aspects to change in the full release. 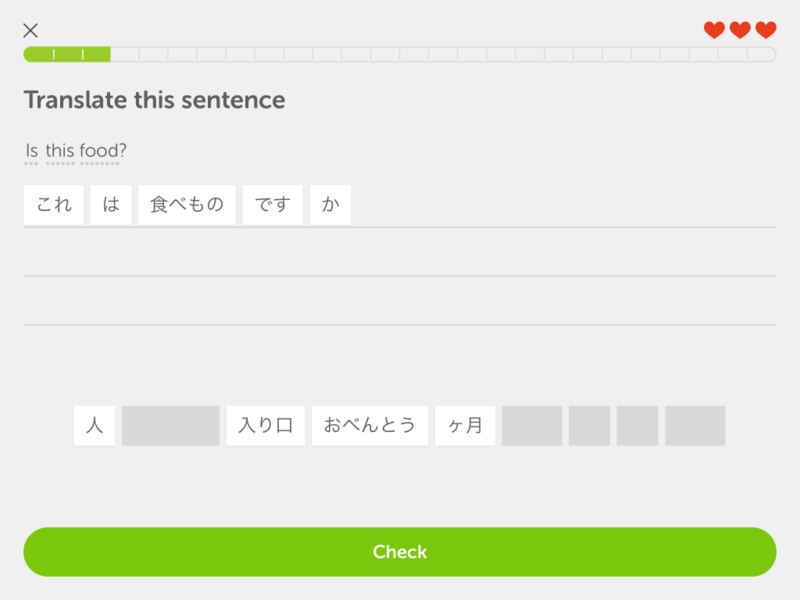 At the end of the day, Duolingo itself is a tool, and while you shouldn’t solely rely on it to learn Japanese, I think it’s still one of the more enjoyable ways to begin your language learning journey. Duolingo is a fun, free way to get your feet wet as a Japanese learner. While it can help you build a foundation for more serious learning, it ultimately won’t leave you with the skills you need to make your way around in the language. What do you think of the course so far? Share your thoughts below! I gave it a try but I didn’t think it was up to the hype. I think that, while there is promise, they need to expand the course and break it up into beginner, intermediate, advanced levels. Including kana, kanji, and (if they chose to) cultural-related examples, there is just so much to cover to even reach a semi-conversational level. Including expressions like: ‘Please shower off before entering the pool’, and ‘Please remove your shoes in the entryway’ would seem vital. I agree with you that there is still a lot of work to be done before it is remotely viable, but I have hope. P.S. Try to do timed skill strengthening (comprehensive). Impossible!!! As a complete beginner to Japanese, I’ve been learning stroke order and trying to write them from memory. 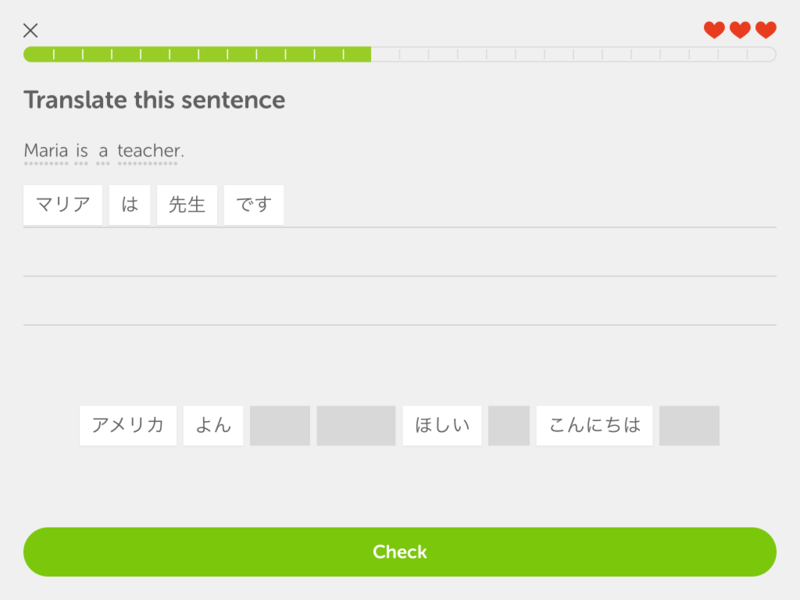 I afterward learned Duolingo’s daily goals go by exp earned, not time passed, so I should have started my learning goal at five minutes instead of 20, as a single lesson can take 10-15 minutes of my playing around with the characters in a notepad. Thanks for the review! 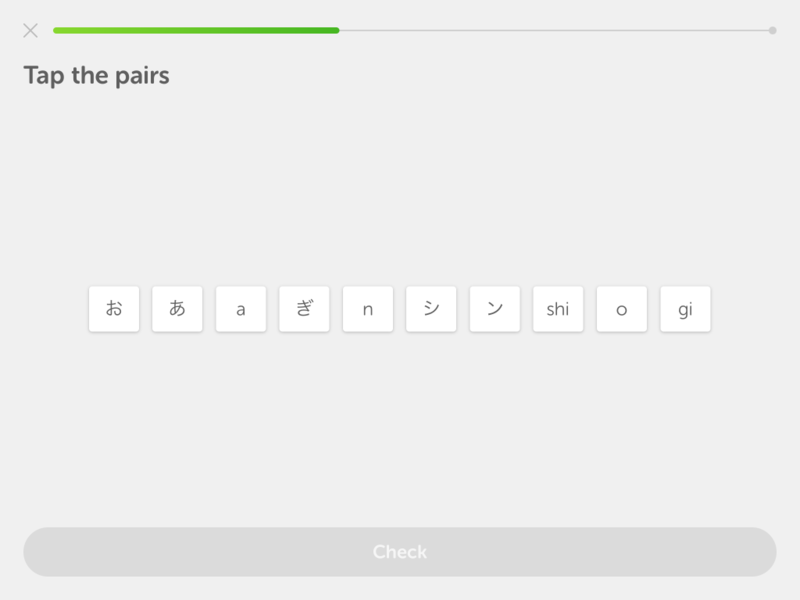 As my first time using Duolingo, I expected it would have grammar lessons once some of the basic characters were taught, so I’m glad to have the heads up and links to further resources. You have a great strategy: taking the time to write characters from memory as you learn. I should honestly include this tip in the article, as it helps solidify what you’re learning and gives you the added benefit of actually being able to write in Japanese. A lot of self-learners who don’t have access to a classroom or a teacher tend to forego writing as a skill, which is unfortunate. In England it’s perfectly normal to say “I am called X” instead of “my name is X”, probably even more common than the latter. (Although most common of all is just “I’m X”. 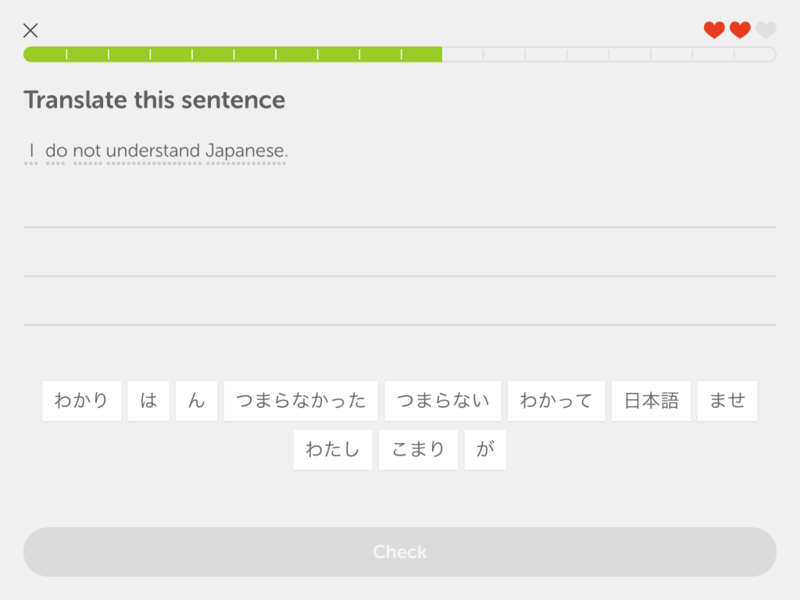 I’m a low-intermediate Japanese learner and I honestly must say , Duolingo is not as good as you made it out to be. 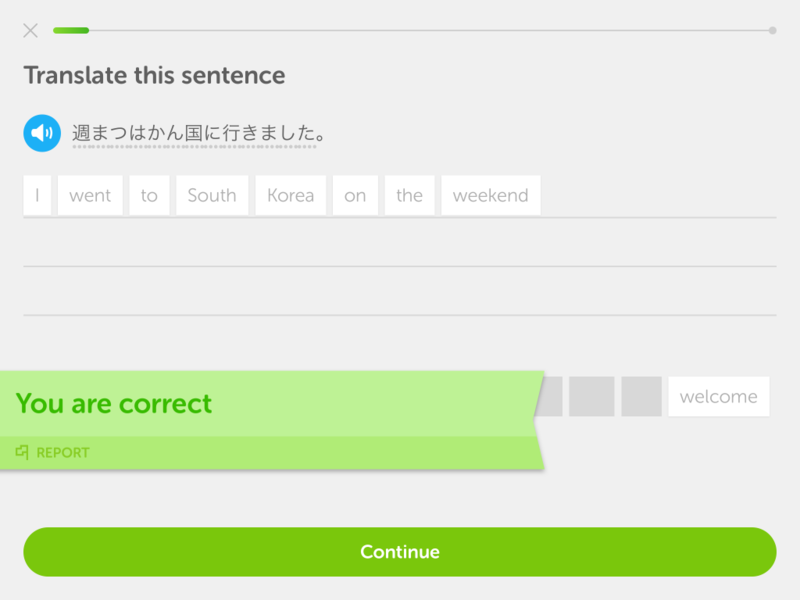 I tried the Japanese and German course on it, and ended up abandoning both. I just tackled N5 kanji right away after learning all kana with some Tae’s grammar lessons sprinkled in. I’m studying for N4 right now in only like 5-6 month (started in late-November). Duolingo , honestly speaking, is kind of a waste of time. I think the team is very ambitious for wanting to teach Japanese with Duolingo, because it’s one of those languages where a self-study approach is less ideal, imo. It’s possible, using a variety of resources and having some guidance–just a little harder than other languages. I still think Duolingo has some potential despite not being the silver bullet so many learners were hoping for. Nice writeup! This is pretty much what I expected, although I am excited it has more kanji right off the bat. 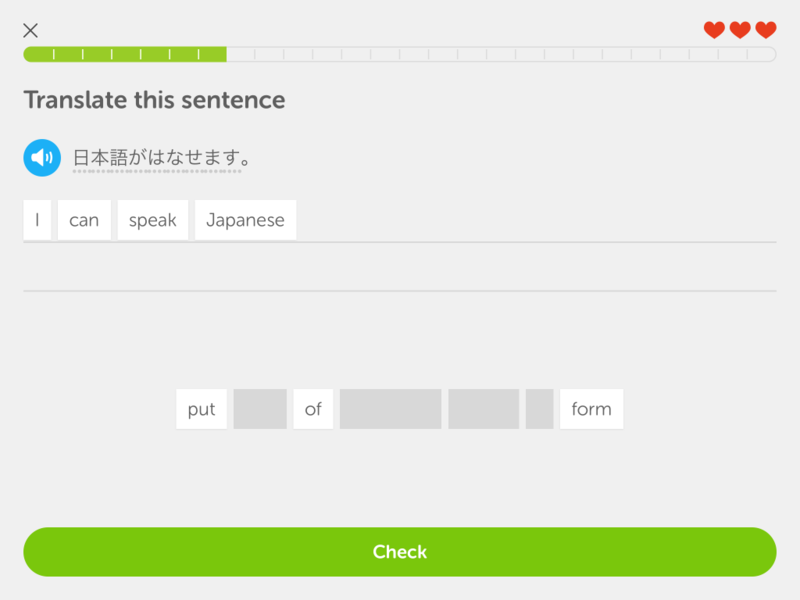 I’m a mid-beginner in learning Japanese, and I already know all the kanji and grammar (according to your screenshots), do you think they will add more? Looking forward to trying it out on Android anyway, I already use duoLingo for Spanish reviews. Also… you didn’t list WaniKani as a kanji learning resource?! Yes, I’m sure they’ll add more. The course will only expand and get better with time, but Japanese is a tough language to teach using just an app–look at how long it took for even the beta to come out. Also, I have a confession to make: I’ve never used WaniKani! I was going to try it out a while ago, but I heard you have to start from scratch, and I figured I wouldn’t be able to get a good feel for what the app really has to offer using just a free trial. Well, it’s still in beta, so I hope little things like this will be ironed out by the full release. I understand your frustration, though. Have you tried other resources such as Human Japanese? It’s pretty beginner-friendly. You can also check out the LearnJapanese subreddit linked above and search “beginner” for more recommendations.